If you’ve been doing Web development from some time now and you’ve looked at several of the Windows 8 samples, you’re probably wondering which event you should handle if you’re interested in doing work as soon as you can. The first option you have is to handle the DOMContentLoaded event. As you probably know, this event will be fired when the current document has been parsed (but might not have been totally loaded – ex. : images might still being downloaded, but you can interact with all the DOM elements). 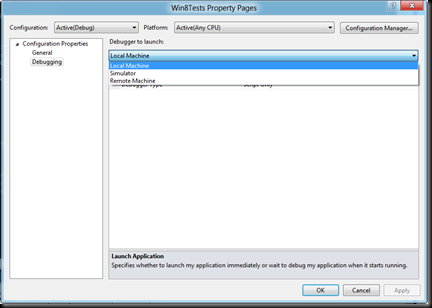 Since you’re writing a Windows 8 application, them you should also know that the WinJS library will handle this event. Internally, the library does some housekeeping, which lead to the generation of several WinJS custom events. 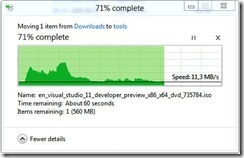 Currently, you’ll end up with the following sequence of events: loaded (fired right after the DOMContentLoaded event), mainwindowactivated (similar to activated; in fact, it’s generated from the internal WinJS activated event handler), activated (occurs after WinRT activation has occurred), ready (occurs when the application is ready and all the housekeeping has been done). Since we’re talking about events, then don’t forget that you must always call the WinJS.Application.start method or you won’t get any of the WinJS events. This happens because, under the hood, WinJS queues events and it will only start processing them after you call that method. Notice that there’s a slight change and we’re returning the result of the storeAsync().then call so that all eventual errors can be handled in the error function passed to the last then method call. You can test this behaviour by adding throw statements in several places in the previous code and by setting a breakpoint inside that anonymous error function. And that’s all for now. Stay tuned for more. 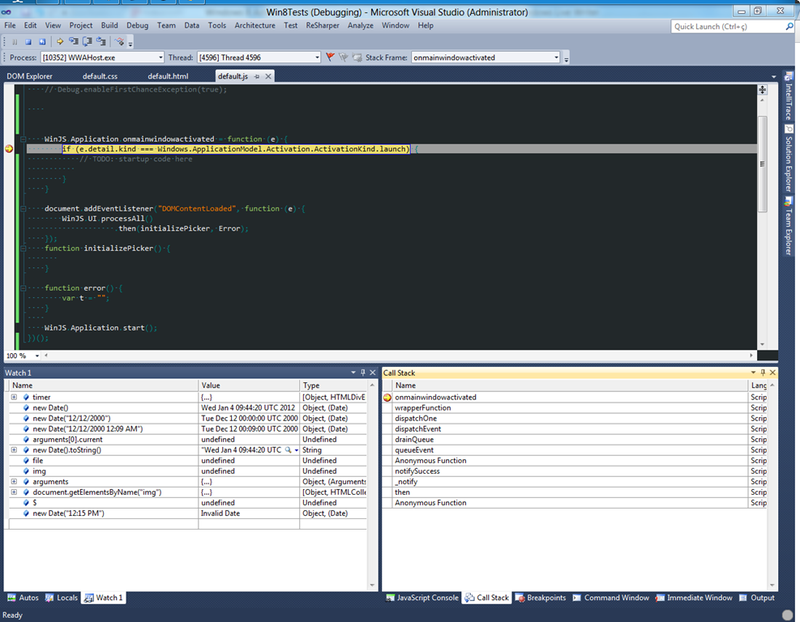 After a small detour into ASP.NET MVC, I’m back into my “Windows 8 application development study”. One of the things you’ll notice when writing Windows 8 Metro applications is that most APIs don’t expose any synchronous methods. If an operation takes more than 15ms to be executed, then you’ll be getting an asynchronous call. And notice that asynchronous is not an option here! It’s simply the only way to go. I’d say that this is better (at least, from a readability point of view). What do you think? In the previous post, I’ve talked about the new Flyout control. 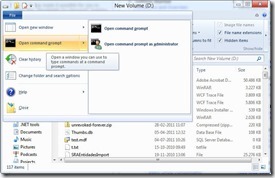 Today, we’ll take a quick look at the context menu. In practice, you’ll show a context menu when you need to show a menu which gives the user immediate access to actions on text or UI objects. If you’ve been paying attention to the HTML evolution, then you know that the HTML5 spec introduces the contenteditable attribute which can be used to make the content of an element editable. Even though the docs say that setting this attribute to true is enough for making the element selectable (and it is! 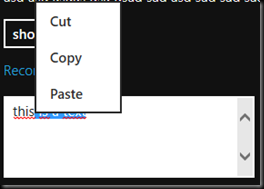 ), there’s a bug in the current preview release associated with the context menu: whenever you apply the contenteditable attribute to an element, you can select text, but right clicking over that selection will not show you the context menu. Since we’re talking about bugs, it’s also important to notice that right clicking over selected text will also end up showing the appbar (if there’s one). I expect to see both these problems solved until we get a final release. we show the menu in the appropriate place by using the showAsync or showForSelectionAsync method. After preventing the default context menu from being shown, we start by creating the PopupMenu which will replace the default context menu. 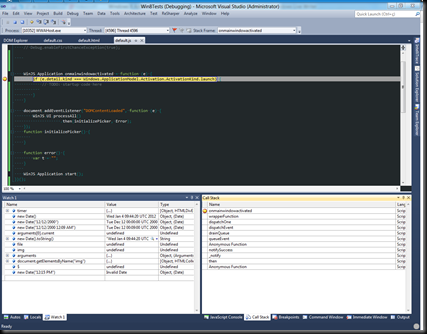 This new context menu is populated with two UICommand instances and one separator (represented programmatically by a UICommandSeparator instance). All UICommand instances expect at least two parameters: a string which will be displayed in the menu and a callback function which will be invoked when that option is selection (which you can set to null!). Optionally, you can also pass a third parameter, which is used for setting the command identifier (in the previous example, I’ve resorted to an integer, but you can pass any object you want). And that’s it for now. 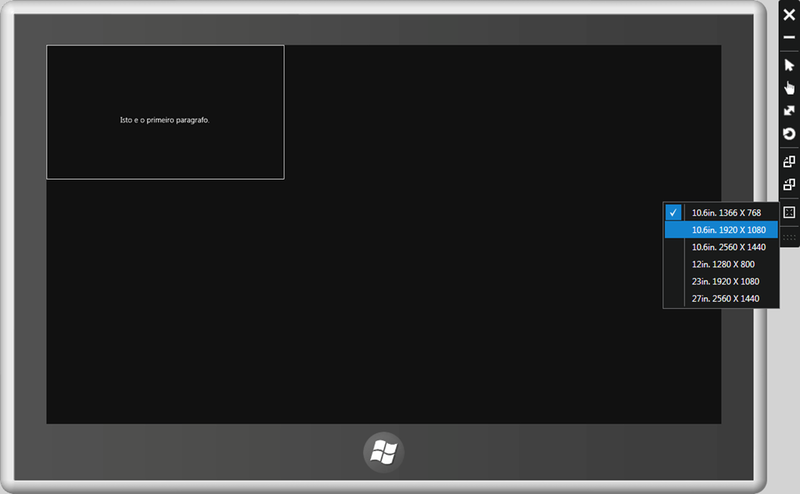 Stay tuned for more about Windows 8 Metro dev. control the dismissal of the flyout and perform a specific operation when the flyout is dismissed (if required). The initializeSample function will only be called after the DOMContentLoaded event has been fired. Internally, the ready method will resort to a Promise in order to execute the initializeSample callback. If you prefer, you can still rely on the DOMContentLoaded event to run your initialization logic. After initializing all the controls defined in the HTML document (notice the WinJS.UI.processAll method call), we initialize a global variable with a reference to our Flyout control and set up an event handler which will be called in response to the afterhide event (this event is raised by the flyout after is has been fully hidden). You’ve probably noticed that we’ve hooked up the click events raised by the showFlyout and confirmFlyout buttons. Showing the flyout requires us to pass an anchor control (in this case, we’re passing it the object responsible for raising the event) and specify it’s relative position to the anchor control (in this case, we’re showing it over the button). The relative position is used as a hint and the flyout position will also be influenced by the current available space (for instance, if our button is placed at the top of the screen, then you shouldn’t really be surprised to see the flyout shown below it, event though you’ve passed top as the flyout’s relative position). Besides the methods and events shown in this small example, the Flyout control exposes others properties, methods and events. You can find more info about them in the online docs. Before ending, there’s still time to mention the existence of the HTML title attribute. If you’ve been doing Web development, you probably know that you can add a tooltip by setting the title attribute. However, creating a tooltip by setting the title attribute is a rather limited approach. For instance, you can only pass it text and you have no multi-touch support. Whenever you need any of these options, you should rely on the Tooltip control. The WinJS.xhr method returns, once again, a Promise objet. In this case, the handleReponse method will be called when everything runs without any glitches. 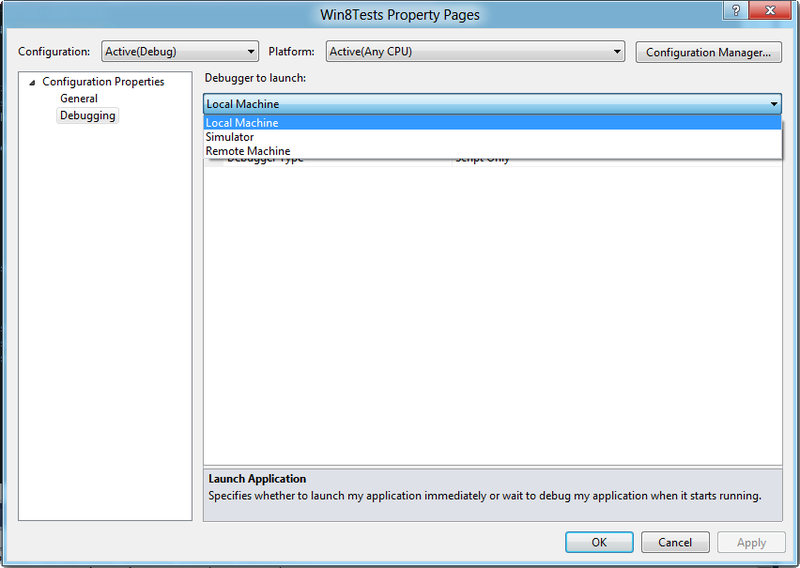 If there are any problems, the WinRT runtime ends up calling our handleError method. In this case, both methods end up receiving an instance of the XMLHttpRequest object used for performing the call. The first time I’ve ran my demo app, it took a while until… my error handler got called. Initially, I thought that the URL was wrong, so I’ve copied it and pasted it into the URL address of Chrome. Nop, there was nothing wrong with the HTML. So, I’ve went ahead and I’ve searched the forums and started emailing some guys. After some time, I got lucky and I’ve found this post. Tiago also gave me a hand by explaining that there was a difference between the local vs. Web context difference. It was only a matter of time until finding the checknetisolation tool. As you can see, our rule is in place and everything should work out just fine…say again? are you sure? Unfortunately, it wasn’t working out fine…I was still getting the timeout and the error function that I’ve passed to the Promise object was still being called. In despair, I’ve went back to the initial post and asked if there was anything I was missing. And the answer was yes, there was: I hadn’t opened port 80 on my firewall. 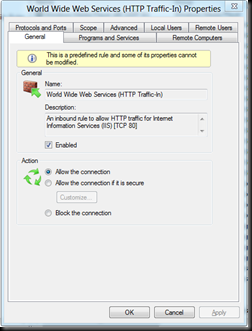 It seems like WinRT xhr calls are always “served” as remote calls and they were being blocked by the firewall. 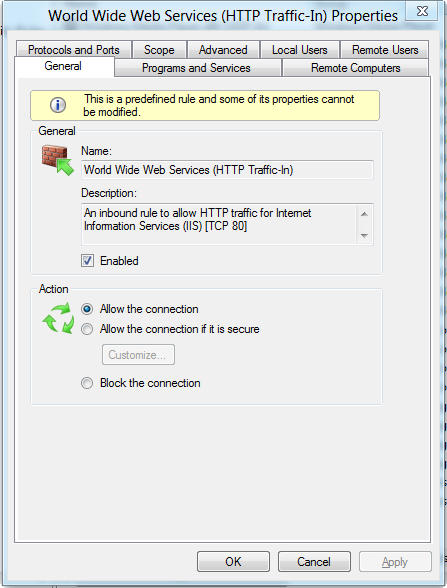 After opening the HTTP 80 port (inbound rules), everything started running smoothly! Btw, one extra note: if you’re trying to get a resource from an intranet machine, then you’ll probably need to require Home/work Networking capability in your manifest. Even though I’ve been using Windows 8 for some time now, the truth is that the Widows 8 Developer Preview version I’ve decided to install at the time didn’t allow me to build Metro Style apps nor to debug existing applications (btw, I’ve decided to go with that version because it was the only one which allowed me to upgrade from Windows 7 and, at the time, the page didn’t mention that you could only only build Metro style apps from the Developer Tools version). This should be really useful for everyone who needs to build an app for several devices and is stuck with a PC (like me!). One of the interesting concepts of Win RT is that most operations that “take time” are asynchronous. 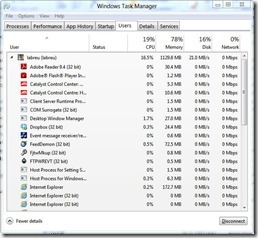 processAll must go through all the DOM and initialize all the Windows 8 controls it finds. That’s why it’s an async operation and, like all asynchronous operations, it ends up returning a Promise object. After getting a Promise object, we can configure it to invoke a callback method when the encapsulated operation is done. In our case, we’re also passing an error function that should be invoked if the “encapsulated” operation generates an error (notice that we can still pass one additional function, that would be called for progress feedback). Our initializePicker function is rather simple: we’re getting a reference to the Windows 8 control (notice the WinJS.UI.getControl method) and creating a new Date object (with the correct time) that is used for initializing the TimePicker’s current property. Posted in Trivia Comments Off on Happy new year everyone! Just a quick post to wish you all a happy new year! Enough is enough! I tipically don’t discuss politics but this time I’ll make an exception . Since it’s about Madeira and Portugal, I’ll write in Portuguese. Se me dissessem no ano passado que hoje estaria a escrever um post político no meu blog e que ainda por cima estaria a defender algumas decisões tomadas pelo Governo Regional, eu diria que isso seria impossível. Não gosto de política, nem gosto dos partidos políticos. Mas a paciência tem limites e a informação apresentada nos meios de comunicação social é tão má, que me vejo forçado a gastar a minha hora de almoço a escrever sobre estes tópicos. Durante os últimos meses, a Madeira tem sido constantemente atacada por todos os meios de comunicação social que insistem em duas teorias perversas e completamente desfasadas da realidade. A primeira é que a região é constituída por parasitas, que se limitam a roubar o dinheiro dos restantes contribuintes do estado Português (esses sim, trabalhadores incansáveis, que andam constantemente a sustentar os mandriões dos Madeirenses). A segunda, ainda mais desfasada da realidade, assenta na teoria de que o problema financeiro de Portugal só existe devido à divida total da Madeira (que ascende, ao que parece, aos 6.3 M milhões de euros). Estas teorias ganham eco através do péssimo jornalismo feito num país onde muitos são pobres, alguns são remediados e poucos são ricos. Não é de agora que tenho dúvidas em relação à qualidade do jornalismo em Portugal. Por exemplo, veja-se este artigo de opinião, supostamente escrito pelo Mário Crespo (alguém que gosta de passar a ideia de ser um profissional a sério! ), sobre a aquisição dos Falcon… Qualquer pessoa que não conheça a realidade pensa que esta compra foi apenas um capricho dos governantes. Pena que um jornalista da sua “craveira” não se tenha dado ao trabalho de investigar a realidade. Se o tivesse feito, não se teria também esquecido de dizer que estes aviões são usados, por exemplo, para efetuar a transferência de órgãos (sim, estamos a falar de salvar vidas humanas, ou acham que os órgãos são transferidos nos aviões comerciais da TAP?) e para garantir o número de horas dos nossos pilotos da Força Aérea (sem horas de voo, não têm brevet para voarem!). Mas enfim, num país onde a mediocridade é normal, também não se poderia esperar que os jornalistas fossem diferentes, certo? Como é óbvio, a verba enviada para a Madeira é bem inferior à dos Açores (e sempre foi, ao contrário do que alguns jornalistas tentam fazer parecer) e inclui as verbas usadas na chamada Lei de Meios, que servem para ajudar a ilha a recuperar dos prejuízos do temporal. Para simplificar, vamos usar o valor 260 milhões como sendo o valor totalmente suportado pelos contribuintes não residentes da Madeira que é cedido à região. Agora, vejamos a receita projetada no mapa do orçamento regional da Madeira de 2011: valor final: 1.6M milhões. Bom, eu não tenho formação em economia ou finanças, mas parece-me que afinal os Madeirenses não estão a parasitar os contribuintes do continente, certo? Ou seja, o valor cedido do OE de estado é importante (que não restem dúvidas disto! ), mas está longe de representar a única fonte de receitas do orçamento regional (ou de ser responsável pelas obras de infraestruturas efetuadas ao longo dos anos – vamos deixar a discussão das obras para outra altura). Antes de passarmos à análise das notícias dos jornais Público e Diário Económico, nada como fazer um aparte e esclarecer outro mito que por aí circula. A teoria geral é: “pois bem, estão a ver? Nós pagamos impostos e o nosso dinheiro vai para a ‘Mamadeira’. Os impostos deles ficam na ilha”. Esta teoria é defendida pelo “grande comentador” Miguel de Sousa Tavares (mente iluminada, que todas as semanas ocupa espaço precioso na sic, a debitar baboseiras sobre todos os tópicos possíveis). Infelizmente esta teoria não corresponde à verdade, como é possível verificar através da Lei das Finanças Regionais. Se é verdade que a maioria dos impostos (ex. : IRS, IVA e selo) é, efetivamente, devolvida às regiões, o mesmo não acontece com impostos extra (como a 5% de redução média dos ordenados da função pública ou a retenção de 50% do subsidio de Natal) ou com IRC (onde a afetação devolvida à região depende da sede da empresa e/ou da existência de representação legal na região). E, sem mais demoras, passo à primeira notícia, escrita pelo Sr. Tolentino Nóbrega, cuja cegueira política contra AJJ (para a qual tem, provavelmente, boas razões), levou à escrita de um artigo onde se depreende que a iluminação de Natal custa 3 milhões aos contribuintes continentais e é apenas feita por laxismo/opulência do “regime jardinista”. Nesta altura, a primeira falácia deve estar esclarecida (recordar receita total esperada da região de 1.6M milhões em 2011). Em relação à segunda, qualquer pessoa que conheça a Madeira sabe que ela só tem dois bens “transacionáveis”: turismo e praça financeira (hoje não vamos falar da praça financeira, mas se continuar a ouvir o Sr. Louçã a dizer asneiras na TV – e ainda por cima, dizem-me que o homem é formado em economia e, pasme-se, dá aulas sobre essa área na universidade – não vou ter outro remédio senão adicionar um outro tópico sobre este assunto tão importante para a sobrevivência económica da ilha). Com noticias destas, tenho de reconhecer que, se vivesse noutra zona do país, e pensando eu que andava a sustentar os mandriões dos Madeirenses, também estaria revoltado e a praguejar (aliás, a minha primeira reação ao ajusto direto foi mesmo um tradicional ‘WTF?’). Mas acontece que o Sr. Tolentino, ao que parece nascido na Madeira, desconhece que o cartaz turístico da Madeira é a quadra natalícia e respetiva passagem de ano! Sim, Sr. Tolentino, no Natal a ocupação hoteleira ronda os 100%. E sim, os turistas vêm cá para ver as tais luzinhas e o tal desperdício de queima de fogo que o Sr. refere no seu artigo. Para além da hotelaria, importa ainda notar que o porto fica repleto de navios de cruzeiro (em média, só no dia 31, temos tido entre 6 e 9 navios!). Se nos concentrarmos só nos navios, é fácil de perceber que as tais luzinhas e o espetáculo de queima de fogo chamam muita gente. Para ter uma pequena noção de valores, é só consultar este artigo, onde é possível verificar que o cancelamento das escalas de 2 navios de cruzeiro no porto do Funchal (em consequência da greve de 24 de Novembro) pode resultar na perda de 500 milhões de euros na economia regional! Portanto, Sr. Tolentino, se há dinheiro que ainda é bem investido na ilha, é este, que é gasto nesta quadra e que acaba por trazer cá vários milhares de turistas. “4. Posto isto, dadas as limitações temporais e de modo a garantir a concretização de uma das vertentes mais importantes do emblemático e maior cartaz turístico da Região, o Governo Regional, através da Secretaria Regional do Turismo e Transportes, optou por recorrer ao procedimento de ajuste directo, um dos mecanismos previstos nos casos em que os concursos públicos ficam desertos. De salientar que, sendo o turismo o principal motor da economia regional e, este evento em concreto, o principal cartaz turístico da Região, o interesse público de salvaguardar a sua realização em conformidade ao que estava previsto determinou que se recorresse a todos os mecanismos que garantissem a sua efectividade. Mesmo assim, importa aqui referir que só foram incluídas neste ajude directo, as iluminações das Festas de Natal e Fim-de-ano 2011/2012 e do Carnaval 2012, dado que, para as seguintes festividades, se procederá à abertura de um Concurso Público Internacional. “6. Dos 4 convites endereçados, apenas 2 concorrentes apresentaram propostas, concretamente as empresas “Som ao Vivo, Lda.” – no valor de 2.067.997,60 – e “Luzosfera, Construções Lda.” – no valor de 1.975.414,44 euros. Posted in ASP.NET Books MVC Comments Off on I’m still here…really! 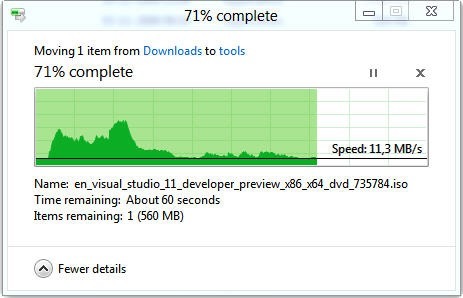 After playing a little bit more with the new Windows 8 preview, I’m a little more used to the new metro UI. I’ve already removed all the default crap (oops, applications…that’s what I meant) and I’ve added shortcuts for most of the apps I use daily. I’m still trying to figure out how to place a shortcut for a folder or an application which works in “xcopy mode”…I’ll probably have to write some code for that, but I’ll need to dig a little more before being sure. I do like the new Windows taskbar. It’s really great to be able to see the app icon in the correct screen. Another thing which I like is the new explorer window. Now it comes with a ribon…I’ve heard several complaints about it, but the truth is that I like it. btw, it brings some new things out of the box. 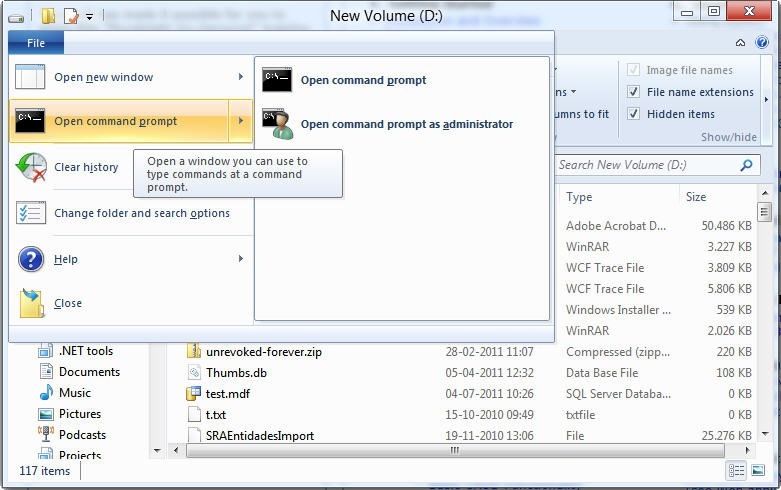 For instance, now you can open the cmd from the folder you’re viewing (check the next image). To be honest, I’m a little surprised there’s no power Shell shortcut (come on, this is 2011 and we all love power shell, right? ). 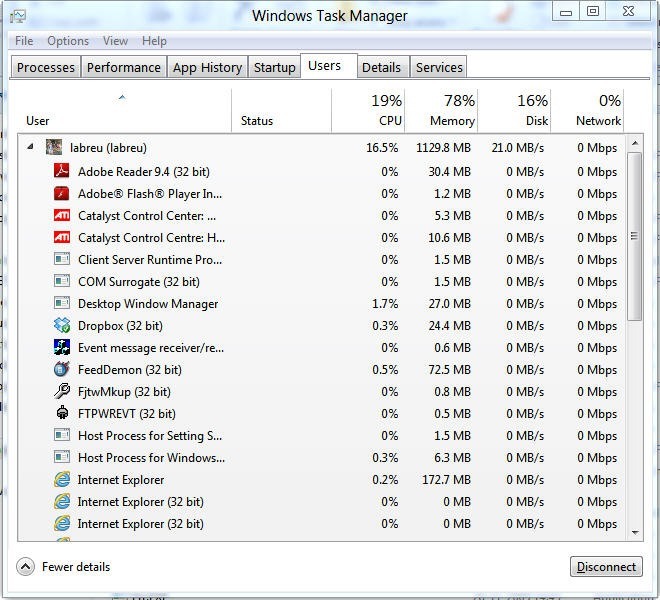 The task manager is another app which has seen several improvements. When you activate the more details window, you’ll end up getting a fair ammount of info presented in a very useful way. 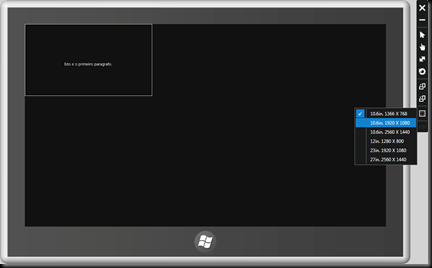 For instance, there’s a users tab where you can see the apps associated to each user that is logged in to the machine. Another nice detail is the new copy dialog. Another interesting improvemente is the new copy file dialog. As you can see in the next image, now we are faced with a graphic which show the corrente throughput. Even better: we can pause the current copy operation (notice the small icons on the top right corner of the dialog windows). Another good news: there’s an out of the box mount option for ISO images (almost sure it wasn’t here before)…There surely more, but I’ll leave it for future posts. Stay tuned for more. don’t forget to pass the old exception as the inner one in the new one. Since we’re opening a database connection, we know we might end up with an SqlException whenever we open that database connection. Getting the information from a database is really an implementation detail and that’s probably someone who is consuming your code doesn’t need to know about. Another interesting to notice is that I’ve passed the caught exception to the InexistingPersonException constructor. By doing this, I guarantee that the original exception isn’t lost and that may help me find the problem when someone calls back and complains about that exception. As promised, today I’ll start presenting some interesting guidelines you should follow when working with exceptions. If there’s one guideline you should *always* follow, this is it: don’t catch every exception there is…especially if you’re developing libraries which will be used by other developers. Whenever you write code like this, you’re saying that you know how to handle all the exceptions that might be thrown. Really? Are you sure about that? What do you expect to do whenever you get an OutOfMemoryException? Do you really know to handle it? And what about all the other exceptions which might be thrown? Things are even worse if you do something like this in a library which is going to be used by other developers. For starters, it’s difficult to know how the application which is consuming your library will respond to exceptions. Probably it can do more than you…probably, not…And that’s why it’s vital to let those exceptions your type can’t handle flow through the call stack. The worse thing that will happen is getting an unhandled exception which ends up killing the process. And this is not such a bad thing because 1.) most unhandled exceptions will probably be caught during development and 2.) sometimes ending the process is the best way to ensure that no data is corrupted. When I write code like this, I’m assuming that all of those methods calls will be executed without errors. Code would need to be much more tedious if we had to check for errors in all those calls. I mean, we have lots of things going on here and we didn’t even went into the IL… It’s really hard to write defensive code for all of this and, in this case, I’m ok with getting an exception in the mappings that ends up terminating my app. Even though this might be a chock for people coming from Win32, the truth is that the productivity gains from doing this kind of things makes it “all right” to rely heavily in exceptions when you’re writing ,NET code. Even though these assurances do help, there will be times when you end up with corrupted data. In these cases, you probably should terminate your app’s process immediately. I’d say that the bottom line is that managed code has a different philosophy and it probably is a good option if you’re writing applications which can be terminated when data corruption occurs. And that’s it for now. On the next post I’ll present some of the guidelines I try to follow when working with exceptions. Stay tuned for more. By using the catch all block, you are, in fact, catching all exceptions. In other words, the first catch block catches all the CLS compatible exceptions (ie, all Exception derived exceptions) and the second ends up catching all non-CLS compatible exceptions. Now, the *GOOD NEWS*: you only need to worry about this if you’re running .NET 1.1. And that’s because MS recognized that it needed to “solve” this problem and introduced the RuntimeWrappedException class. Whenever you add the RuntimeCompatibilityAttribute to an assembly (which is done automatically by the C# compiler), all non-CLS compliant exceptions are wrapped by a RuntimeWrappedException object. This means that from 2.0 onwards, you can really catch all exceptions by using the 1st code snippet I’ve shown. Btw, if you want you can get the real thrown exception by accessing the WrappedException property (notice that it references an Object and not an exception). What’s the message that you’re going to pass into the Exception constructor? The first step is really important: you should choose an exception type which is meaningful. This is an important decision because you need to consider what will happen when you throw that exception. 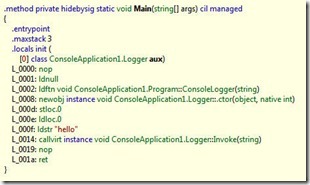 You should start by looking at the predefined exceptions introduced by .NET. If none of those brings the semantics you’re looking for, then you should probably create a new one. In this case, I’d say that you’re better off by reusing Exception as the base type of the new exception (in fact, if you need to create several exceptions for a specific application, then it’s best to make the hierarchy shallow and wide, ie, with as few base classes as possible). After choosing the exception type, you should also give some thought about the message you’re passing in when you instantiate that exception. As I’ve said before, this should be a technical message, so don’t be afraid to get into details. Whenever an exception isn’t caught, it will end up as an unhandled exception. In practice, this means that it will probably end up in the event log and, when that happens, this message should be a good starting point for us to know how to handle the current problem. Since this message shouldn’t really be shown to the user, then you probably don’t need to worry about localizing it. Having said this, I must confess that there is a place where I don’t follow these guidelines: whenever I need to develop WCF services, I tend to catch eventual expected exceptions and transform them into new exceptions, with user friendly messages tackled into its, which are propagated into the client (WPF or Silverlight). The first interesting point is that we should always make the new exception serializable. Besides applying the Serializable attribute, I’ve also implemented the interface and overrode the GetObjectData inherited from the base Exception class (the serialization part is simple and it will only save/restore the value of the _incorrectName field). In order to personalize the message, I’ve also opted for overriding the Message property so that it appends the name of the field to the message that is passed in the constructor. Btw, and since I’ve mentioned the constructor, notice how I’m taking advantage of optional parameters (instead of writing three constructors, I’m writing just one! – the second one is only there for deserialization purposes). I’ve also overridden the Equals method (and the GetHashCode) to ensure that the comparison between two instances of this type is perfomed correctly. The code isn’t really complicated, but, as I’ve said before, is rather tedious. If you want, you can also use generics to create a new generic type which you can reuse for all your exceptions types (in this case, it’s clearly a good idea to transform the String parameter into a generic type parameter!). I couldn’t end this post without mentioning that I’d wouldn’t really create this new exception type in a “real world” application (at least, not in my domain code). The reason is simple: .NET already offers an ArgumentException class which is more than adequate for this kind of error. In fact, I would leave these verifications for the code contract framework, which does a very good job in verifying pre and post conditions and invariants! If you’ve checked the docs for the Exception class, you’ve probably noticed the Message property. This property (which, btw, is read-only) contains info about the error and it should also explain how to fix the problem. Notice that this isn’t an error friendly message; in fact, it’s a technical message and this means that it shouldn’t be shown to the final user. There’s also a Data dictionary, where you can find a collection of key-value pairs with extra info about the exception (if you’re the middle-man, you can add-more information to this entry and re-throw it). The TargetSite and Source properties reference, respectively, the method that threw the exception (MethodBase instance) and the name of the assembly that generated the exception. Finally, there’s also an InnerException property which references the previous exception when the current one was raised when handling the first one (we’ll return to this topic in future posts). If you look at the MSDN docs on exceptions, you’ll notice that there’s a long long hierarchy. Many of the predefined exceptions inherit from ApplicationException or SystemException. Originally, MS recommended that all new exceptions should expand one of these types. The idea was not bad since new applications exceptions should inherit from ApplicationException and system exceptions should expand the SystemException class. If that guideline had been followed, then it would be possible to have catch blocks which would handle all system exceptions or all applications exceptions. Unfortunately, not even MS followed its own guideline! This means that there are system/CLR exceptions which inherit directly from Exception and others which inherit (wtf?) from ApplicationException… Bottom line: these two classes are useless in the real world! And that’s it for now. In the next post, I’ll present some considerations you should keep in mind when throwing an exception. Stay tuned for more. After a great month of vacations, it’s time to go back to work. And this time, I’ll write a couple of posts about exceptions and exception handing in .NET. In .NET, we should generate an exception when a member (method or property) fails to complete its task correctly. Did you noticed the “fails to complete its task correctly” part? It might be a little bit cryptic, so let’s expand it a little more. Say you’ve got a method which needs to change the value of an integer field as a result of some operation performed over another object it receives as a parameter. There might be some assumptions here…for instance, suppose that that method needs the passed in object to be in a specific state…if that doesn’t happen, then you probably should signal that by generating (ie, throwing) an exception. If you’re consuming that method, then you need to know how to handle an exception. And that is what I’ll discuss in this post. Whenever you write code that might throw an exception, it’s a good idea to wrap it up with a try block and specify the exceptions you’re prepared to handle . As you can see, the DoSomething method can recover from the specifics InvalidCastException and AmbiguousMatchException exceptions (notice the use if the catch keyword). Within a catch block, you’ll probably find some logging code which gets and logs information about the current exception. If you’re not able to recover from the exception, then your best option is simply to rethrow the current exception (as it’s shown in the catch all exception block – the third catch instruction). Don’t be tempted to rethrow the exception by writing throw ex;. If you do that, you’ll end up with a new exception stack and the original error stack is lost! simply let the thread “leave” the current catch block. As you probably know, the catch block code will only be executed when the code in the try block generates an exception. When you have several catch blocks (as in the previous example), the CLR will evaluate them from top to botton in the order they were declared until it finds one whose parenthetical expression’s (ie, the expression which appears after the catch keyword) catch type is compatible with the current exception’s type. That’s why you should always put the more specific exceptions at the top. If the CLR doesn’t find any matching catch code block associated with the try block where the exception was thrown (this doesn’t happen in the previous example because there’s a catch all code block), then it will keep looking in the current call stack until it finds a matching catch block or until it reaches the top of the call stack. In this last case, you’ll end up with an unhandled exception (more about this in future posts). On the other hand, when the CLR finds a matching catch block, then it will go “back” and execute all the “inner” finally code blocks, starting from within the one associated with the try block that threw the exception and stopping in the catch block that is responsible for handling the current exception. At this point, the CLR executes the code of that catch code block and, only then, will it execute the associated finally block code (provided that you don’t rethrow the current exception or throw a new exception from within the last catch code block!). The finally block is optional and it must always be defined after all catch blocks (if there are any). After finishing executing the instructions defined in a finally block, the thread will simply jump into the next instruction. Before ending this post, there’s still time to mention that it’s possible that some code defined within catch or finally blocks might end up throwing an exception. This is definitely *not* a good thing, but it’s also not the end of the world. When this happens, the CLR’s exception handling mechanism I’ve explained in the previous paragraphs will kick in and execute again as if the exception was thrown after the finally block. Notice, however, that all the information about the original exception is completely lost (it’s as if it didn’t happen). And I guess this is it for now. Stay tuned for more on exceptions. Posted in .NET Basics C# Comments Off on Vacation time! As I write this, I’m getting ready for enjoying month away from my daily job. I hope it’s enough for resting, but what I’d really love is to hear from you, my faithful reader . I know I haven’t really posted much in these last couple of weeks, but I’ve been really busy updating my HTML5 book (it will more examples which try to illustrate how you can combine several new features introduced by HTML5). I’m not really a guru in any of these areas but, as I said, I’ve been working in all of them for quite some time now and probably I can still write one or two interesting entries about them. Thanks for your feedback! Ah, the joy! Almost in vacations, but still one day to go! And now you can invoke the delegate by executing the DynamicInvoke method like we did before. Before ending, there’s still time to say that you shouldn’t really use the CreateDelegate overloads which use strings (instead of MethodInfo instances) because there’s a chance of getting an ambiguous binding (and that might lead to unpredicted results). I’ve started by declaring three Logger variables which are initialized with three different lambda expressions. After that, I rely on the static Combine method for creating new delegates which “combine” our delegates variables. As you can see, I start by combining del1 with null. When this happens, chain an del1 end up referencing the same memory address. The second Combine call produces more interesting results. Since chain already references a delegate, then this Combine call ends up creating a new delegate whose internal delegate list is initialized with an array that holds the two elements passed to the Combine method. As you’re probably expecting, the last Combine call will also return a new Delegate but notice that its internal invocation list will have three (not two!) delegate references. You might expect it to have two since our chain variable holds a delegate returned from the second Combine call and you might think that the third call would combine that delegate with del3. However, that doesn’t happen and the last delegate’s internal delegate list will reference our 3 delXXX delegates. One interesting result of this behavior is that the delegate returned by the second Combine call can be garbage collected since there isn’t any variable referencing it. Btw, you can access this internal delegate list through the GetInvocationList method. Now, if we invoke chain, all delegates’ methods end up being called. As we’ve seen, calling a delegate through the method syntax is the same as executing the Invoke method. Internally, this method will check the delegate list. When that list is not empty, it will call all delegates present on that list (when the list is empty, it will use the target and method fields for invoking the correct method). You’re probably wondering what happens when our delegate matches a method that returns a value (different from void). Well, in that case, the returned result is the one that is returned by the last delegate that gets executed. By now, you’re probably thinking that if we can add delegates to the internal list, then we can probably remove them from that list. And that’s true: we can remove a delegate from the list by using the static Remove method. This method expects two parameters: the first references the delegate whose internal list will be searched for; the second identifies the delegate that should be removed from the list ( match is found when a delegate’s target and method fields reference the same objects as the delegate that is passed through the second parameter). Notice that you can’t really reuse the MulticastDelegate type in C# because the compiler won’t allow you to use those classes directly from your C# code. If you take a look at the MulticastDelegate’s code, you’ll quickly notice that it doesn’t define these properties. In fact, these properties are exposed by the Delegate type, which is used as base by the MulticastDelegate type. To be honest, I really don’t have any good explanation for having two delegate classes since our delegates definitions end up always creating new classes which expand the MulticastDelegate type (and no, you can’t either create a new type which uses Delegate as a base type in C#)…Going back to the snippet, I believe I should mention that the Method property returns a reference to a MethodInfo instance (this type provides us access to a method metadata – this means you also use it, for instance, to get the name of the method that is being invoked). aux( “hello” );//what happens here? But there’s more…the astute reader has probably noticed the “Multicast” string in the MulticastDelegate name’s type. It’s obvious that using indirection to invoke a method is really powerful, but what about using a delegate to chain the execution of several methods? We’ll see how we can do this in the next post. Stay tuned for more.